Fresh ground beans make a big difference in the flavor of your coffee. This is why having your own coffee grinder is beneficial. But then there’s the question of what kind of coffee grinder is best to buy? There are two primary options: blade grinders and burr grinders. We’ve found that burr grinders provide users better consistency and control, allowing you to select the grind size by adjusting the distance between burrs. There are 2 types of burr grinders; conical and flat. We will guide you through the difference between them to determine which is best for your purposes. The conical burr grinder has 2 cone shaped burrs with serrated edges that grind the coffee. One burr stays stationary while the motor turns the other. The beans go in vertically at a slight angle. The conical grinders use a less powerful motor and go at a slower speed. Because the motor is less powerful it features its own set of advantages, like quiet operation. These grinders are also valued for being easy to use. Flat burr grinders have 2 rings of burrs that lay horizontally or parallel with the ground. One burr faces up and one faces down. Like the conical grinder, one burr is stationary while the motor moves the other one. The coffee beans are dropped down vertically between the burrs. Then after they’re ground, the grounds drop down beneath the burrs. Flat burr grinders use a powerful motor that can grind coffee faster, but the extra power does come with its own set of minor issues. These units are generally louder and more prone to clogs. AWARD WINNING GRINDER - Voted Best Product by the Specialty Coffee Association. Both conical and flat burr grinders are a good choice when buying a coffee grinder. They grind coffee consistently and are easy to use. Although homebrewers would be well off with either choice, coffee professionals do prefer one over the other. These minor differences make one grinder more beneficial to buy. This is explained more below. Conical grinders are easier to dial in and they do not require adjustment as much as a flat burr grinder. This is an observation made by coffee professionals because they adjust their grind so often. For at-home brewing, it shouldn’t make a big difference since most brewers tend to use the same settings almost every time. Flat burr grinders tend to get more grounds stuck inside than conical burr grinders. The conical design makes it easier to get the grounds loose, whereas the flat burr design traps grounds better. This can vary from model to model though. 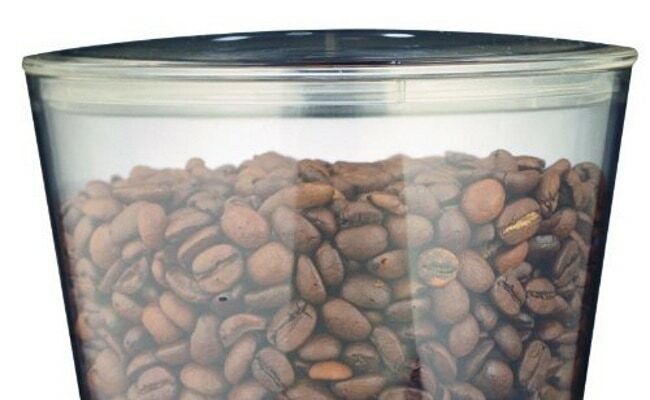 This is another minor difference, but it can change how quickly you use up coffee beans and how easy the grinder is to clean. The last difference is the speed of the motor. This was mentioned in the grinder’s general description. The conical grinder has a slower motor. The slower speed may seem like a disadvantage, but it isn’t. A slower motor actually makes less noise or none at all. It prevents the coffee grounds from getting hot like they can with a fast motor. Slower motor speeds also enable a grinder to get a finer grind without getting clogged. Conical burr grinders have more advantages over a flat burr grinder. They require less adjustment. Its design is better for getting grounds out and makes it easy to clean. The slower motor prevents noise, hot grounds, and clogging. In short, the conical burr grinder will not disappoint. Which coffee grinder under $100 is our favorite? Learn here! What’re the differences between burr and blade grinders?